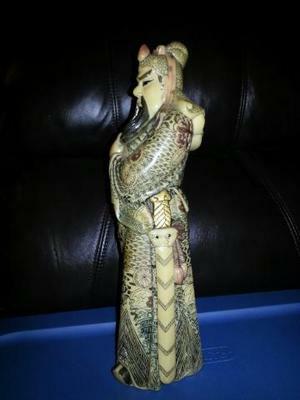 Hi Peter, I have a friend that bought this piece at auction. 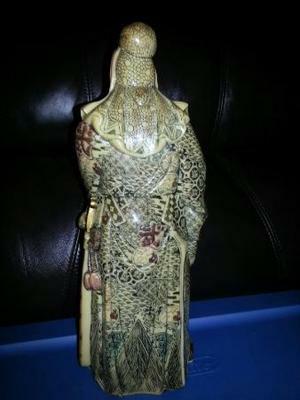 She is an avid collector of Asian pieces. I was wondering if you might shed some light on the mark at the bottom of the statue. I thought that it was a bit unusual that his sandles were complete even on the bottom of the statue. Not sure of what the material is, I haven't seen it in person. I realize that it is a Japanese Samurai Warrior but was hoping you might recognize the piece anyway ;) thanks for any help. Vickie C.
I believe you are right about who it is depicting, especially the way he is holding his beard. That helps much more for the search, now if we can decide what material it is. Thanks again Peter. 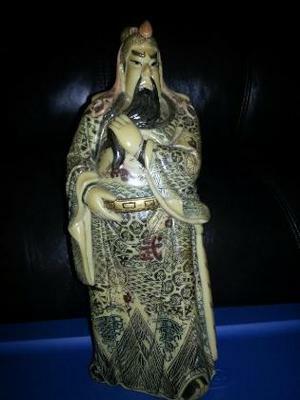 This could be depicting Guan Yu, a deified hero of the Three Kingdoms period, at the end of the Han dynasty. He is famous for his beard. But other deities do have beards too. I don't know what material it is. 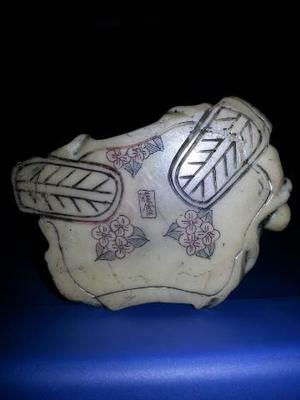 The carving could be imitating ivory, but it is more likely is that it is some sort of resin, if it is not stone. Looks relatively new.